The ThINKin' Spot: Fun With Flip Its!! Anyway, one reason I wanted to hop on here today is that today is the day that these amazing new dies are being released at The Stamps of Life! Have you heard about these Flip Its Dies? Like I told a friend the other day, I don't exactly live under a rock when it comes to paper crafting goodies, BUT I somehow missed this Flip Its boat! These things are amazing!! You can read all about them HERE. Here are the cards I made with these new dies. SO easy, and fun, and I LOVE the WOW factor then lend to my cards! I've SO got to have more of these dies!! 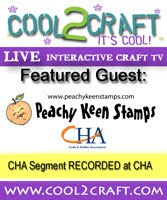 This first card was created with the newly released stamps at Peachy Keen Stamps. LOVE that jar, and PKS has a beautiful new website, BTW, so if you haven't checked that out, RUN and do it now, because it's all up and running like a top now!! 20% off of all new releases, too! SUH-WEET!! For this card I used PK-1339 Clear Canning Pint Jar, and PK-1341 Clearly Autumn Pint Jar Accessories. Here's a look at the opposite side. These Flip Its fold to an A2 card size in case you were wondering. And, here's a close up. You can't really tell in the photo, but there's acetate over the jar, which looks really shiny and realistic in real life. The next grouping of photos I have to share are of the same Flip Its die set, and stamps from The Stamps of Life. Just in case you can't tell, I sure love creating Autumn themed cards! For this card I used the Raccoons2love Stamp Set from The Stamps of Life. And finally, a close up. I hope you've enjoyed my creations today. I did have a lot of fun making these, and was truly surprised at how easy they were to make using those "new to me" dies! As mentioned above, they are now available at The Stamps of Life, and head over there and check 'em out!! So now, it's back to cleaning, sewing, laundry, and getting ready for the wedding festivities to begin! Have a wonderful day, thanks for stopping by and HAPPY STAMPIN'!!! Both of these cards are so cute! I love these, great fall colors and fun cards! Lorie!! These are amazing!! LOVE LOVE LOVE your work... and YOU!! :) You're the bestest friend EVER! HUGS and lots of LOVE! I am loving these card and wow, I must check these out.